Despite the fact that Christmas felt like three days ago, January is just about over. But it's not all bad because the end of January means that Valentine's Day is coming, which is a great opportunity for a couple of theme manis! And you all know how I feel about theme manis, right? Haha! Oh, Kenya, you're a total nut bag and I love ya for it. When that was dry, I added two coats Explosion of Fun to the three smaller hearts and Glitterbomb to the larger one. And can we just stop for a second to talk about Glitterbomb? It's, quite literally, the bomb, guys and gals. Sooooo much sparkle in this one, which obviously explains why I'm so obsessed with it. Haha! Originally, I'd planned on leaving my white nails plain, but then I realized that was a ridiculous idea considering I hadn't used Mirrorball yet. So, I used a medium dotting tool for my thumb, middle, and pinky finger, and then used a smaller dotting tool to dot around the hearts. Like I've said before, when the light hits these glitters, it's like HOLY SPARKLEPANTS, and the crisp white background makes them pop out even more. I love these polishes, people. Looooooooooooove them. It's going to be really hard to hoard them use them sparingly. Haha! So what are you rocking this week? Are you already in the Vday spirit? Link up and show off! Your big heart looks totally symmetrical. Well done! I really like the Mirrorball dots on the white, too. It's kind of like snow and kind of like stars. 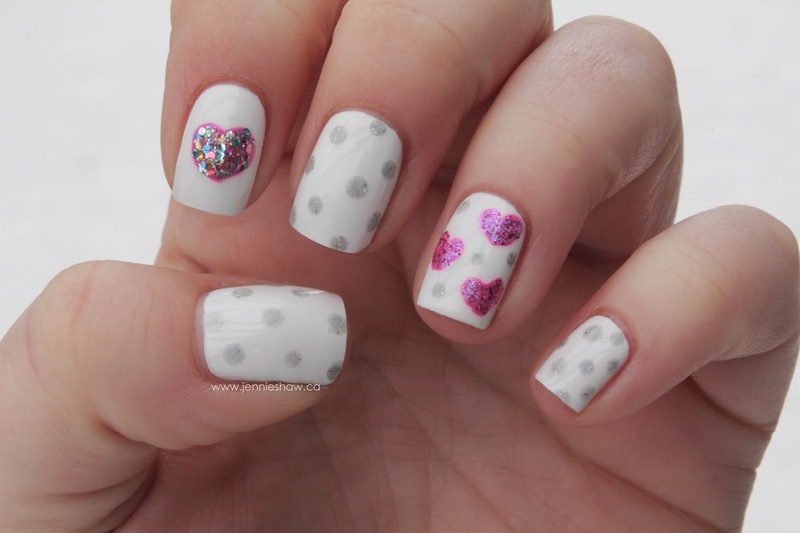 adorable nails, I just got some dotting tools. I can't wait to try them out. So cute. La Vita Loca looks so pretty. I love this! I think this might have to be my next mani. I was browsing for a Valentine's themed one and this is my favorite. I had to stop browsing and actually started mentally checking off the polishes needed. That's the moment I realized this is it! How cute. I love doing dots.